M.Phil. , 1998 , Department of Sanskrit, University of Delhi. Ph.D. , 2005 , Department of Sanskrit, University of Delhi. M.A., M. Phil. and Ph.D. in Sanskrit from the University of Delhi, Delhi. SRF (Senior Research Fellowship) and JRF (Junior Research Fellowship) with NET from the UGC. Teaching Sanskrit at Hans Raj College, University of Delhi since 2005. Member, Senate, Kameshwar Singh Darbhanga Sanskrit University, Darbhanga, Bihar, 2016-19 (Chancellor's Nominee). Member, Curriculum Development Committee, Indira Gandhi National Open University (IGNOU), 2009. Member, Expert Committee, B.N.M. University, Madhepura, Bihar. Member, Selection Committee to take the interview of candidates for the post of principal, Dayanand Brahma Mahāvidyālaya, Hisar on 02-03-2007. Member, Selection Committee to appoint lecturer in Sanskrit in Dayanand Ayurvedic College, Jalandhar on 10-08-2007. Member, Executive Committee, Credit and Threft Society, Hans Raj College, 2008-10. Member, Executive Committee, Hans Raj College Allumni Association, 2009-12. Member, International Seminar & Debate Committee, Hans Raj College, 2008-09. Member, Diamond Jubilee Celebration Committee, Hans Raj College, 2009. Member, Development Fund Committee, Hans Raj College, 2008-09. Member, Students’ Welfare Committee, Hans Raj College, 2008-09. Member, ECA Committee, Hans Raj College, 2006-2007, 2007-2008. Member, Hostel Committee, Hans Raj College, 2007-2008, 2008-2009, 2010-2011. Member, Library Committee, Hans Raj College, 2007-2008, 2010-11. Member, Sports Committee, Hans Raj College, 2007-2008, 2010-11. Member, Annual Prize Distribution Committee, Hans Raj College 2007, 2008, 2009, 2010, 2011 & 2012. Member, Teachers' Welfare Fund Committee, Hans Raj College, 2007-2008. Member, Concurrent Course Committee, Hans Raj College, 2006-2007. Member, Anti-Ragging Committee, Hans Raj College, 2007-2008, 2008-2009, 2009-10, 2010-11 & 2011-12. Member, Resident Teachers' Welfare Committee, Hans Raj College, 2009-10. Member, Delhi University Teachers' Association (DUTA). Member, Hans Raj College Teachers' Association (HRCTA). President, Staff Association, Hans Raj College, University of Delhi, 2012-13. Convenor, Admission Committee, Arts & Commerce, Hans Raj College, University of Delhi, 2013-14. Deputy Centre Superintendent, Hans Raj College in Annual Examination, 2007-2008. Observer, Joint Test for admission to BBE, BBS and BFIA at Mathematics Department, University of Delhi, Delhi. Head Examiner for B.A. Sanskrit (Hons. ), IInd year, University of Delhi, Delhi, 2010-11 & 2011-12. Co-Examiner of Sanskrit for B.A. (Programme), University of Delhi, in 2010-11 and Sanskrit (Hons.) Ist year in 2011-12. Teacher-in-Charge, Department of Sanskrit, Hans Raj College, 2007-2008, 2010-2011, 2017-18. Editorial Adviser, Sanskrit Manjari, Sanskrit Section of the Hans Raj College Magazine, ‘HANS 2008-09’ & 2016-17. Media co-ordinator, Hans Raj College, 2010-11. Returning Officer, Hans Raj College Hostel Election, 2007-08. President, Akhila Bhāratīya Mithilā Navanirmāna Mancha, New Delhi. Secretary, Hans Raj College Resident Teachers' Welfare Association, University of Delhi, 2008-10. Secretary, Sanskrit Sāhitya Parishad, an Academic Society of Hans Raj College, Delhi, 1994-95. Editor, Hans Raj College Magazine 'HANS' (Hindi) 1994-95. Editor, 'SANSKRIT MANJARI' 1992-93, Sanskrit Section of the Hans Raj College Magazine. Cultural Secretary, Gwyer Hall Students Union (1996-97), Delhi University. Treasurer, Hans Raj College Alumni Association, 2012-15. 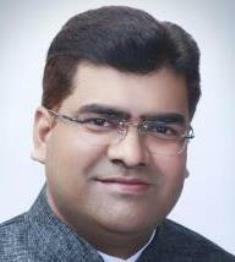 Executive Committee Member, Hans Raj College Alumni Association, 2009-12. Ph.D. Thesis: Samasa Shakti Tatha Shabdashakti Para Nagesh, Bhattojidikshita Tatha Kaundabhatt Ke Vicharon Ka Tulanatmaka evem Samikshatmaka Adhyayana. One Ph.D. student has been awarded his Ph.D. Degree by the University of Delhi, under my supervision. One Ph.D. student has submitted his thesis and another student is pursuing his research, under my supervision in the University of Delhi. Two students have been awarded M. Phil. Degree by the University of Delhi, under my supervision. "Samāsashakti Tathā Shabdashakti" by Vidhyanidhi Publication, New Delhi, 2015. Nāgesha Bhatta Krta Sphotavāda: Ek Samīksha by Vidhyanidhi Publication, New Delhi, 2017. Mithila ki Panji Vyavastha (Aadhunika Vijnana ke vishesh sandarbha mein) by Vidhyanidhi Publication, New Delhi, 2017. Translated two books titled 'Swachha Jungle ki Kahani: Dadi ki Zubaani (Vol. 1 & 2)' in Maithili language, published by the Publication Division, Govt. of India, 2017. "Shābdabodha Vishayaka Nāgesha Bhatta ki Avadhāranā", in Sanskrit Vidya (Annual Research Journal), published by Kashi Hindu Vishwavidyalaya (BHU), in 2011. "Vaiyākaranon ke mata mein shakti kā Swaroopa" in Shodh-Prabha (Quarterly Research Journal), published by Shri Lal Bahadur Shastri Rashtriya Sanskrit Vidyapeeth, New Delhi, in July, 2011. "Vishwa Bhāshā Darshana Ko Bharatīya Dārshanikon kā Adbhuta Yogadāna: Sphotavāda" in Shodh-Prabha (Quarterly Research Journal), published by Shri Lal Bahadur Shastri Rashtriya Sanskrit Vidyapeeth, New Delhi, in October, 2011. This paper has been presented in the World Sanskrit Conference held in New Delhi. "Nārī-vimarsha kī drishti mein Abhijnānashākuntalam", in Abhyudayah (An International Bi-annual Research Journal), published by Abhishek Prakashan, New Delhi, in July-December, 2014. "Ādhunika Vaishwika Paridrishya mein Sanskrit Adhayayana kī Upayogitā", in Abhisecanam (An International Bi-annual Research Journal), published by Abhishek Prakashan, New Delhi, in July-December, 2014. "Kautīliya Arthashāstra mein Pratipādita Kara Vyavasthā", in Sanskrit Vidya (Annual Research Journal), published by Kashi Hindu Vishwavidyalaya (BHU), in 2014. "Samāsashakti: Ek Samagra Vishleshana", in Sanskrit Vidya (Annual Research Journal), published by Kashi Hindu Vishwavidyalaya (BHU), in 2015. "Vyākarana Darshan mein Shabdārtha mīmamsa", in Vaak Sudha (An International Refereed Quarterly Research Journal), Delhi, in May-July, 2016. "Tanāva Prabhandhana aur Sanskrit" in Global Thought (An International Refereed Quarterly Research Journal) Delhi, in February, 2017. "Vittiya Prabhandhana aur Sanskrit" in Global Thought (An International Refereed Quarterly Research Journal) Delhi, in February, 2017. "Aadhunika Vijnana aur Sanskrit" in Vaak Sudha (An International Refereed Quarterly Research Journal) Delhi, in January-March, 2017. "Paryavarana Samrakshana aur Sanskrit" in Vaak Sudha (An International Refereed Quarterly Research Journal) Delhi, in January-March, 2017. Attended an Orientation Course for the teachers conducted by the University Grants Commission in collaboration with the Institute of Life Long Learning, University of Delhi, Delhi. Also presented a paper on the Relevance of Sanskrit Studies in Contemporary World. Attended a refresher course in women studies gender studies (ID) conducted by CPDHE, University of Delhi and sponsored by the UGC in 2012. Attended a refresher course in sanskrit conducted by CPDHE, University of Delhi and sponsored by the UGC in 2014. Attended a course 'Navya-Nyāya Language and Methodology (Level – I)' conducted by the Centre of Advanced Study in Sanskrit, University of Pune and obtained A+ grade in the final test. Attended the same course on 'Navya-Nyāya Language and Methodology (Level – I)' conducted by The Special Centre for Sanskrit Studies, JNU in collaboration with Rāshtriya Sanskrit Sansthāna, New Delhi. Also attended the course on 'Navya-Nyāya Language and Methodology (Level – II)' conducted by Indian Institute of Advanced Studies, Shimla, Himachal Pradesh. Attended a one-week workshop on Vākyapadīya conducted by the Department of Sanskrit, University of Delhi. Presented a research paper on 'The Theory of Sphota' in the World Sanskrit Conference - 2001, held in New Delhi. Paper on Śābdabodha accepted for presentation in the 41st Session of All India Oriental Conference (14-16 December, 2002), held in Puri, Orissa. Participated in an International Seminar on Bhartrhari: Language, Thought and Reality held at India International Centre, New Delhi on December, 12, 13 & 14, 2003. Many talks have been broadcasted on All India Radio (AIR) on various topics such as The Contribution of India towards the World Knowledge System, Composite Culture in India, Water Conservation, Pandit Nehru etc. Invited for the Panel discussions on different Television channels on various issues. Teaching M.A. and M. Phil. classes of Indian Culture and Civilization as Guest faculty at Department of Sanskrit, University of Delhi, Delhi since 2008. Invited to teach Indian Culture and Civilization to M.A. (IDC) students by the Department of Sanskrit, University of Delhi, Delhi in 2010-11 & 2011-12. Invited to teach Ancient Indian Economy and Polity to M.Phil. students by the Department of Sanskrit, University of Delhi, since 2008. Invited to teach History of Sanskrit Grammar to M.A. (Final year) students by the Department of Sanskrit, University of Delhi, Delhi, since 2008. Invited to teach B.A. (IInd year) students by the School of Open Learning, University of Delhi, Delhi. Initiated and organized an Annual Lecture Series entitled Indian Intellectual Heritage in 2007. Initiated and organized Mithila Navanirmana Lecture Series to discuss the various developmental aspects of Bihar especially, the North Bihar or Mithila, in 2010. Sanskrit Samārādhaka Sammāna from Delhi Sanskrit Academy, Delhi. Junior & Senior Research Fellowships with eligibility for Lectureship from the UGC. The Certificate of Merit from Hans Raj College, University of Delhi. All India Post Graduate Scholarship, 1995-97.